Who’s tan, rested, and ready for another full week of saintly action? That was rhetorical. Of course you’re tan. Today we have an intriguing Biblical matchup between Esther and Lazarus. Courageous queen vs. friend of Jesus. Who will advance? That’s up to you. After a depressing weekend without any voting, you may have forgotten what transpired on Friday. Edith Cavell, yet another one of the 2018 Cinderellas, took down theological heavyweight John Wesley 68% to 32%. She’ll face Anna Alexander in what should be a lively Saintly Sixteen matchup. It’s hard to believe we’re exactly halfway through the first round. But it’s true. Eight matchups down, eight matchups to go before it’s on to the the next round. Hang on to your halos! Esther, a saint from the Hebrew Bible, lived between 520-450 BCE, in the Persian Empire. She was an orphan raised by her devout cousin Mordecai. King Ahasuerus was king of Persia, but he was not known for being a nice guy. When we first meet him, he summons his wife Vashti to appear before a room of visiting dignitaries. When she refuses to appear, he orders her to be killed. Yikes. To replace Vashti, the king holds an ancient beauty pageant: Women from all over the empire are summoned so that he may choose his favorite. Esther is declared the most beautiful in the kingdom and becomes queen—but she has not told anyone at the court, including the king, that she is Jewish. Meanwhile, Haman, the king’s chief advisor, is struggling with some major ego issues. Because he believes Mordecai slighted him on the street, Haman convinces the king to order the murder of all Jews in the kingdom. 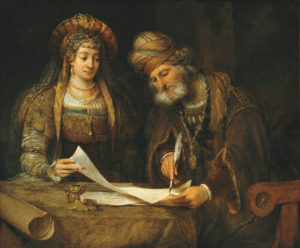 Mordecai informs Esther, urging her to do something. So Esther concocts a plan. In Persia, a law forbade entering the king’s presence unless he sent for you, under penalty of death. Esther asks the Persian Jews to pray and fast with her. Then, she gets dressed up and goes before the king—unrequested—and risks her own life. Thankfully, the king has pity on her and grants her an audience. She takes the opportunity to invite the king and Haman to dine with her that evening. That dinner party goes so well that she suggests a second dinner party the next evening. The second night, after dinner is winding down, and everyone is in a good mood, Esther seizes the opportunity to come out as Jewish and announces that if Haman is to kill all the Jews in the land, then that would include her. MIC. DROP. The king immediately decrees that Haman should be executed. He stipulates that the Jews will now be allowed to fight in their own defense on the day of the proposed mass execution. And so Esther saves the Jews of Persia. Esther’s story has come to be seen as emblematic of how a minority can wield power within a majority culture. She negotiates power imbalances and exercises her privilege on behalf of her people and in the service of God. Through her story, she is wholly herself and still protects her people. O God of the dispossessed, kindle in us the confidence and certainty of Esther, that we may hold fast to who we are, and seek to do your will, even in the most difficult of circumstances, through Christ our Lord. Amen. 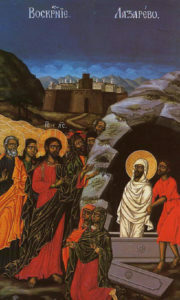 Lazarus of Bethany (also Lazarus of the Four Days, referring to the time he was dead for four days) is intimately connected with the life of Jesus. According to the New Testament witness, Lazarus and his sisters, Mary and Martha, were some of Jesus’ closest friends. The eleventh chapter of John’s Gospel recounts Jesus’ deep grief over the death of Lazarus, and the subsequent miracle of his resurrection. Like many biblical figures, Lazarus only makes a brief appearance in the text itself, but numerous extra-biblical traditions have been handed down and provide deeper detail. According to John 12, Lazarus’s resurrection garnered a great deal of attention, both from those who were inspired by the story and from those who were threatened by it. Later tradition suggests that Lazarus fled Judea for someplace safer, perhaps in response to threats upon his life. Two theories developed about Lazarus’s flight from Judea; a more recent tradition tells of his travels to Marseille, France, while an older tradition tells of him settling in Cyprus. In both traditions, Lazarus lived for another three decades and continued to witness to the work and message of Jesus. Although there are few details of Lazarus’s personality, it is not hard to imagine that his death and resurrection must have profoundly changed him. According to one story, seeing death made him very somber, and he smiled only once in his remaining thirty years. Some scholars have suggested that Lazarus is the unnamed “Beloved Disciple” of John’s Gospel, a view that adds even more poignancy to the scene of Jesus’ grief outside the tomb of Lazarus. In Western traditions, the witness of Lazarus is remembered, along with his sisters, on July 29. In the Orthodox church, the day before Palm Sunday is known as Lazarus Saturday—a foretaste of the joy of Easter Sunday as the church prepares for Holy Week. Generous God, whose Son Jesus Christ enjoyed the friendship and hospitality of Mary, Martha, and Lazarus of Bethany: Open our hearts to love you, our ears to hear you, and our hands to welcome and serve you in others, through Jesus Christ our risen Lord; who with you and the Holy Spirit lives and reigns, one God, for ever and ever. Amen. 215 Comments to "Esther vs. Lazarus of Bethany"
I have to go with Esther, risking her life to save her people. Esther – she was willing to sacrifice herself for the other Jews. I agree with you, Pailet. Had to go with Esther. Lazarus came back from the dead, and he can come back from this. Yes, Esther was a great Jewish patriot — but this is the only book of the Old Testament in which the name of God is not mentioned! We talking about a contest of saints, here. How prayerful was Esther? Lazarus was a friend of Jesus, whose death (even though Jesus knew what he was going to do), was the occasion of what, in the RSV translation, is the shortest (and one of the most memorable) verses in the New Testament: “Jesus wept.” And his death is the occasion of the great affirmation of faith by his sister Martha of Bethany “You are the Christ” and Jesus says “I am resurrection and I am life.” Lazarus’ story is and has been a great comfort to grieving Christians for 2,000 years. To add an interfaith touch, Lazarus is also respected and remembered by Muslims. There is a mosque in his honor right next to the traditional site of Lazarus’ tomb. God is also not mentioned in the Song of Songs or Song of Solomon, whichever translation you are using. I believe God’s name is mentioned in Song of Songs as an intensifier but not directly, like saying something is “heavenly” doesn’t necessarily refer to the state of “heaven.” Just FYI, not to disagree with your counterargument. That the book of Esther never mentions God is hardly a condemnation of Esther herself. After all, the book is in the canon of Scripture. How prayerful was Esther? Who knows? The book doesn’t describer her prayer life. For that matter, The Gospel of John never says anything about the prayer life of Lazarus either. For the Jewish people, one of the major holidays is “Purim” : a celebration of Esther and her act of bravery. Christians for the most part ignore Esther, but not the Jewish faith. Also, many Muslims do likewise believe in the story of Esther, just like many of them believe in Lazarus. Maybe the book never mentions God because God in reality doesn’t intervene through miracles nearly as often as through the bravery of ordinary people, taking leaps of faith when God seems most absent. Declarations of faith are all well and good, but it takes bravery to stand up to tyrants and save lives. Well, Esther invites her fellow Jews to pray and fast with her. Who are they praying to and what are they fasting for? they are praying to GOD – ADONAI. They are fasting the same way the Jewish people fast on Yom Kippur. I am not sure what you are asking. Excellent point! And the vote is for Lazarus not for Jesus’s raising of Lazarus! I vote Esther! Esther’s story belongs in the canon for sure: it clearly has both historical realism and an account of God’s will being made manifest. But the scholarship suggests the story is fictional–which doesn’t diminish its canonicity or Esther the character as a model follower of God–but it does make me less inclined to vote for someone as a saint. (Not to say Lazarus’ story is without fictional elements–but the resurrectional thrust is where I put my trust.) For instance, I’m all for voting for Harriet Beecher Stowe, but not as much for her saintly characters Tom and Eva. Furthermore, I don’t vote for Old Testament characters on principle. Not because the Hebrews and Jews aren’t God’s people, but something important changed with the advent of the Messiah, Jesus, and that change opens the door for what I consider “saints” to exist, certain church’s saints lists notwithstanding. This also excludes archangels. I’ll just add that while I do value the story of Lazarus greatly, for reasons already mentioned, I’d be far happier to see Martha of Bethany compete for the Golden Halo again. Esther’s story has always even one of my favorites. She’s courageous and against the prevailing social order, turns a negative situation not of her choosing into the salvation of her people. Hard decision on a Monday morning. Lazarus, close friend of Jesus whom Jesus raised from the dead and brother of Martha and Mary or Esther who risked her life to save her people. After much pondering, I had to go with Esther. My thoughts exactly! Too much thinking on a Monday morning! i have to growth Esther. She risked her life for a cause. The write up considering today’s circumstances of many oppressed people made a clearer argument for what matters. I like Esther. Using her privilege in service to her people and to God. They are! My sister made some with halved mini cadbury creme eggs in the center once. They were amazing. Hamantaschen made with Easter eggs; it’s food that really brings us together! Like. The above mentioned Hamantaschen sound delicious!! Recipe? Be great for coffee hour on a Sunday! I like Lazarus more for his sister Mary who sat learning from Jesus while Martha worked, so he must have been a supportive brother. But I voted for Esther as affecting so many people. I heard a sermon preached a couple of weeks ago about Esther. The phrase “for such a time as this” stuck with me. Gotta go with Esther. Perhaps we are here for just such a time as this. Go, Esther! Hello, Debbie. Only hear from you at LM time. Esther for me today. She used her privilege for the benefit of others. A great example for us today. Esther of course- Purim is this week! Yes, it is! How could one not vote for Esther when it is her celebration on Wednesday? Thanks to Lazurus, we get a demonstration of both Jesus’ humanity and divinity. We witness his grieve at his friend’s death and and then one of his greatest miracles. The story of Lazurus has always filled me with awe. I voted for Lazarus. In Jesus’ mourning for his friend, we see that Jesus was fully human just as he is fully divine. Me, too. Esther, story is just that – a story. Didn’t happen. Great story, though! I am an Esther fan, admittedly. Curious to know why you say “it didn’t happen” but the story of Lazarus is true? I would second that query. What kind of vegetable is Esther? Inquiring minds want to know. Esther all the way. But the SEC missed the obvious which would have been putting Esther’s matchup on Wednesday, which is Purim. Had to go with Esther today – she took a great risk as a minority and made a difference in the time in which she lived for a whole nation of people. Sounds like she would fit right in today!!! Go Esther. This one is difficult. Esther was very diplomatic in her efforts to save her people, and she was successful. Not much is known about Lazarus did have to live a quiet life afraid of being looked upon as a strange man who was raised from the dead?? If we knew for sure about the legends of Lazarus, I might have voted for him. but i have always loved Esther, even though she was sneaky just like Ruth and Naomi. Gutsy women. Esther got my vote. Have to go with Lazarus. He was Jesus’s close friend and disciple and likely spent the next 30 years spreading the gospel. Have trouble relating to the older saints for some reason. I guess because Lent is about our Lord’s life, ministry, death, resurrection. Our life ! I voted for Lazarus because Jesus made him rise from the dead. there ya go! Laz (that’s our nickname for him) knows all about resurrection, and what’s not to love about that??? Amazing, a governmental official doing the right thing at the right time. Esther show us what happens when you take a chance for the right. the lady gets my vote. We hear of near death experiences and people who return to life talk about seeing a great light. I wonder what Lazarus saw and what he told his sisters of his experience. If we presume some of the tradition is true about Lazarus as a preacher to others about Jesus, he must have experienced something more profound than a 4 day sleep. You asked the bloggers which saint they would like to have a meal with and what would they serve. I think my choice might be Lazarus and I would serve eggs (resurrection symbol). But no, I didn’t vote for Lazarus, as intriguing as the guesses might be. To stand up to power for justice’s sake, speaks volumes — especially in this day. What a beautiful song! Solidified my vote! Thank you for putting this song here about Lazarus! Carrie Newcomer is very inspirational singer. I never heard of her until today! I listened to her other songs as well. But Esther still got my vote! Esther has always been one of our favorites from the Old Testament, so voted for her. Esther has a whole book of the Bible named for her which, in the throes of Madness, is reason enough to give her my vote. Oh, dear, poor Lazarus is getting THUMPED. I might just as well have voted for him, on the principle that “any friend of Jesus is a friend of mine.” So sorry. That is a beautiful bit of etymology! Also, Stella (Latin/Italian), estrella (Spanish), stern (German) and étoile (French). I love Esther’s action, her strength, courage, and intelligence; but that so very human relationship Jesus and Lazarus had; that is what inspires me to accept and abide in that unfathomable resurrectional love. That love is the mystery of our faith. And that’s why I voted for Lazarus. I voted for Lazarus as representing the early Christians who came to Southern France and founded their own branch of Christianity. From what little we know about it, it sounds very Gnostic and similar to some of the Nag Hammadi texts. It was suppressed and mostly lost after the twelfth century crusade which exterminated unorthodox believers. What can I say? My wife is Jewish. This is the week of the Purim festival in which the Jews will celebrate Queen Esther’s quick thinking and risk taking. And I can’t read the name Haman without following it with loud “Boos” and clanging sounds. Purim spiels at synagogues are a real hoot. Sorry, Lazarus. I have always admired Esther. Back in my days of teaching Religion (and science) in as small Episcopal school I had a Jewish student in class. When Purim came around, I taught the story of Esther to the 3rd grade class and the young man shared how his Synagogue celebrated Purim with us. What a wonderful learning experience for both the class and for me! As an Eastern Star member we have five heroines of the Bible…….Esther represents the wife as the third star of the five……..so must go with her. The odd moment is that the fourth point of the star is represented by Martha. To me, Queen Esther stifled her fears and planned a way to save her people! While I don’t know how I’ll vote today, I have a question for the Lent Mdness community: why did Jesus weep? Was he sad for Lazarus’s suffering? Sad for all his friends who thought Lazarus was dead and should have known He could raise him? Or sad he had to pull Lazarus back from Paradise for the sake of the greater Kingdom? This is one of those Biblical mysteries I have to ponder every Easter season! Good questions, Ruth. I had never thought of these. I always assumed it was because Jesus grieved for his friend like we would. But of course you’re right, He knew He could raise Lazarus. Something more to think about on this gloomy (we haven’t seen sunshine for several days) Monday morning. I think Jesus wept because Martha dressed him down for being late and letting Lazarus die; a lack of faith and trust in her BFF. Besides, as Jesus had not died and resurrected, Paradise wasn’t open yet. I’ve always taken it as his own very human feelings of grief at even the idea of losing his friend, and his empathy with all who were grieving — his humanity at play even though he knew what divine action he was about to take. Why do any of us weep? Weeping, particularly the weeping of grief, has a language and a logic all its own. Sometimes when I weep it takes me by surprise and goes on longer than I might think convenient. Then it may conclude before any indication that it’s reaching a true stopping point. Like the wind of the Holy Spirit it moves in and out on its own terms. Jesus’ weeping is comfort to me in my weeping, in in helping me to trust the awful language of grief. One other thing, when I am weeping I do sense that I am experiencing all previous losses amidst a fresh loss. Perhaps Jesus was weeping for all who had been lost up to that day, all who died alone or without hope, and for all who were yet to die, including himself. The love and grief of his friend Lazarus was, perhaps, a foretaste of the cross where all griefs find their reconciliation. Thus endeth this homilette and my midday break. Back to emails and bulletins. Thank you,, Matthew, for a really lovely entry–talking about the awful language of grief and experiencing all previous losses amidst a fresh loss. I hope your time is not completely taken up with emails and bulletins but that you write more. That said, it is interesting, on a lighter note, how important meals are–Mary, Martha with Jesus as a guest, Esther with her successful dinner parties. Oh yes, I voted for Esther the outstanding hostess. Yes, Nancy, I agree, the best transformations happen around the meal table! Thank you for encouraging my writing. I voted for Esther! Matthew, thank you for this reflection. I too liked the part about weeping being the language of grief and the part about experiencing previous losses amidst a fresh loss. I thought it was very insightful. Thank you for this perceptive and pastoral response. I was going to add that Jesus wept in anticipation of his own battle with Death, and in the same way as he experienced agony in Gethsemane. Death is a formidable enemy, however and whenever we face it. Lazarus, because he is the promise that though we are unworthy, God too will raise us. Esther all the way. She was a female savior, risking death for the sake of her people. Had to go with Ester. She was willing to put it all on the line for God and her people. To use one’s wits, wiles and every opportunity at one’s disposal (and to usurp, in faith, those things which are NOT at one’s disposal) for the good of others took a profound act of faith. The execution of Esther’s plan which could have led to her own execution bespeaks the kind of courage we often see lacking in today’s challenges. That she is held in such high regard by people of many faith traditions is of no small matter! Lazarus: for having the guts to come out! What did Lazarus do but be dead? Jesus is the act-er. Lazarus is the recipient of the action. Being raised from the dead may be halo enough. Going with Esther, a beauty pageant winner who made a difference. Yeh, Lane, I’m with you— all Lazarus did was be dead. From what we know from the Gospels, Lazarus and his sisters stood by Jesus and his disciples and gave them shelter and food repeatedly. It can’t have been easy for Lazarus, who was apparently supporting two sisters and possibly other family members, to find food and room on the floor for thirteen more people. Lazarus and his household provided succor and comfort and we never hear any complaints or criticism of the visitors — only Martha’s complaint that Mary isn’t helping her with the extra work required to receive guests. I think of Lazarus as one of the supporters of Jesus and his apostles who made their three years of traveling, teaching, and praying possible, no less than Zachariah or Joseph of Arimathea. This is looking like the year of the women, “for such a time as this”. Well, my sister, brother-in-law, niece, and nephew all work at a boarding school that has a Lazarus project of its own. It’s the school of last resort for kids who have been kicked out of other schools for one reason or another, some as many as half a dozen schools. St. Johnsbury Academy has designed its curriculum and support services to assist these kids as they complete their high school education and get into college, and they’ve had a really good success rate. However, my home parish has become a center for interfaith dialogue, and our Bible studies have almost always featured Esther in a prominent position, so after the usual vacillation I went with Esther. Esther all the way because it sounds like EASTER. Can’t vote for someone who smiled only once in 30 years. Mary, you made me smile, and laugh! Really — lighten up, dude! I voted for Esther because of her bravery and courage. She stood out even when it could mean risking her life. But in the end, she defeated the enemy, and saved thousands upon thousands of people. Jesus is always doing for and with us that which we cannot do for ourselves. Our job is to let Him love and guide us, and love Him so completely that God’s will may be done through us. This is not nearly as passive or as easy as it sounds. Lazarus heard the voice of Jesus and came out of the tomb to live with and for Him He gets my vote. When I thought about Lazarus and his sisters and their inclusion of Jesus into their family and their deep friendships, I was reminded that friends can become family. As a single person, the families that always have a place for me at the table hold a special place in my heart! I voted for Esther. She showed courage in the face of discrimination and danger and I see parallels in her story to events going on today. Much can be learned from her story. our present culture! Although I have always been fascinated by the Lazarus story, this particular choice was obvious to me. GO ESTHER!! Thank you , Celeb. Blogger Megan & the SEC author of our email intros for your great humor –Love the morning smiles you bring!! I have always loved Ester’s story, but I have to ask – are we Americans rewarding Ester for acting and diminishing Lazarus for being passive, the recipient of Jesus’ action? Is that not what we are called to do – to accept Gods grace? An interesting perspective. Thanks for the insight. Tan? Surely not everyone who plays Lent Madness is white. And where do you get tan in February in Chicagoland? Esther’s story is really compelling, and relevant today…but she might not have actually existed. I’m going with Lazarus, who might have been the Beloved Disciple, but who definitely was a friend of Jesus’. It’s interesting to note a parallel between today’s saints, though: neither of them asked for the thing that made them famous! Esther had no choice in the matter of being taken as the king’s wife, and Lazarus certainly didn’t ask to be brought back from the dead! Perhaps that’s why he smiled only once —-in the thirty years that he lived again! So torn. Our congregation’s Bible study had a whole discussion last week about people (like Lazarus) being raised from the dead. Also I had a pet mouse named Lazarus after we thought he had died from nibbling the wrong thing but miraculously returned to life. But it’s hard to argue with “all he did was be dead,” despite his subsequent solemn life. So, with Esther I go! I went into this thinking about how God is not ever mentioned in the Book of Esther, and besides, aren’t saints by definition people who profess faith in Jesus? But Esther in her sacrificial courage is a forerunner of Christ, and indeed as someone upstream pointed out, in her actions may have made his birth possible. And actions speak louder than words — indeed in the Hebrew word for “word,” debar, word and action are essentially synonymous. And so, in times like these, Esther got my vote. Hmmm, I would’ve thought Lazarus would have done nothing but smile for 30 years after getting yanked back from the brink! He must have been something special to have been one of Jesus’ besties, and I wish we knew more about him and his sisters. I think Jesus truly grieved over Lazarus’ death, and for the pain he caused Martha and Mary by dilly-dallying around before responding to their message. But my vote today is for Purim, for the Sheherazade of the Hebrew world (although Esther’s story came first! ), for the brave woman who never forgot her roots, despite fame and fortune. Esther for the gold! Actually, I’m not so sure Esther’s story preceded that of Sheherazade. . .
Today was a harder choice than I thought. My Mom’s name ( and now my granddaughter) was Esther. Both touched the world with their devotion. In the end Esther won out. Esther. She is an inspiration of how one person can change the course of history. I voted for Esther because of her courage and willingness to be a martyr, the willingness to act against evil. I just want to know exactly what she did at those dinner parties to have such an impact, so that I may go and do likewise! Rise again, Lazarus, rise again. Although there are some more convincing arguments for Lazarus here than I would have thought possible, I voted for Esther, if for nothing else inspiring a Jewish friend’s favorite holiday. But of course, there is so much else! “Oh once there was a wicked wicked man and Hamman was his name sir, he lied and lied about the Jews but they were not to blame sir!” Esther all the way, from my roots in Judaism she has always been a hero to me. I love the symbolic symmetry of Esther’s story, and the non-biblical oral traditions that follows Lazarus. Thank you for a wonderful Monday morning read. Oh, I voted for Esther. Lazarus has had a somewhat repelling fascination for me ever since I saw _The Last Temptation of Christ_, where he is depicted as, well, death warmed over, still somewhat decayed from his death experience. Another similar influence has been Carrie Newcomer’s song about him. I think it probably was very difficult to be the one the Jesus raised from the dead, and so I’m giving him my sympathy vote, although I was happy to learn about Esther. I think Lucy said it best… “Jesus is always doing for and with us that which we cannot do for ourselves“ and the story of Lazarus bring that point home. Going with Lazarus. I gotta go with the risen guy. For me there’s nothing of historical substance in either of these stories. (Don’t @ me.) The question is, Which makes the better narrative? Going by the principle “best story wins” I choose Lazarus. He’s almost constructed to be the blank screen upon which we all imagine our own death and resurrection. I imagine myself bound up in white linen and suspiciously well washed, stepping out of a sterile dry enclosed space with the wrappings falling off and feeling the sun on my skin for “the first time,” how delicious that would be, how wondrous, how lovely. My whole body tingled with singing. St. Celia, that is lovely! Thank you for sharing. I believe that the Lazarus story was included in the gospel of John to echo the story of Elijah raising the widow’s son, thereby comparing Jesus to Elijah. While the details of the actual Esther story are lost in antiquity, I think she actually existed. Therefore I voted for the real person as opposed to the fictional one. Much as I love the story of Lazarus, I have to go with Esther. Risk taking pays off, making a stand for her people. I am going to renew my protest from the first day of Lent Madness. The seedings are terrible. Esther v. Lazarus should be at least a second round match up. That’s the only lyric I can quote. Are you sure you aren’t trolling us all this morning? Esther would not have joined the gucci gang. And Dat Boi does not seem like the resurrection type. So I’m a bit confused about your contribution. Perhaps you could provide a hint as to your aim for joining this little party ambling to Canterbury. Well, Lazarus is a Christian saint. Strong woman Esther! Minority women do what must be done to save family and culture. Be like Esther! Those of dominant and supremist ilk take note. Esther, for all the reasons others have given, especially the “acting versus acted upon” argument. by risking her own life going before the King! Lazarus was a friend to Jesus and spread the good news, but Esther was more forthcoming in her decisions! I just checked in the Book of Esther and it says the King put Vashti away, but not that he had her killed. Vashti was always an unsung heroine of this story to me. The impression I always got was that Xerxes wanted her to dance like a trained monkey for his friends and that she refused because she was “proud.” He thought he was getting someone more compliant in Esther, but he thought wrong. It seems every one has seriously thought about their vote. That’s good. I had to vote for Esther because that was my grandmother’s name and it is my daughter’s middle name. What can I say? Notwithstanding pious traditions to the contrary, I always thought that the logical conclusion to John 12:10 is that the’ chief priests’ succeeded in their plans to have Lazarus killed, just as they succeeded in having Jesus killed. Esther was a hero, but Lazarus is us, living the reality of death and grief, living in hope of resurrection, being a friend of Jesus, hearing and responding to his voice to come out of the tomb. Realistically I’m not going to be a hero, I certainly won’t win a beauty contest and I won’t hoodwink a king. I will live in obscurity as Lazarus did before and after this episode. My hope is to live as a friend of Jesus faithfully, responding to grace as he did. This is not to say that Esther didn’t have those qualities too, but I cannot translate that to my life. I didn’t vote for “John the Evangelist” because I am one of the people convinced that Lazarus was actually the “beloved disciple.” So I voted for him today so I could cast a vote for that fourth gospel. I don’t mind that Esther will advance — she is certainly admirable. In case anybody is interested in the reasoning behind the “beloved disciple” question, here are some rationales. John 11:36: So the Jews said, “See how he [Jesus] loved him [Lazarus].” Lazarus is the only person specifically mentioned as having been loved by Jesus. John 18:15: That disciple was known to the high priest — how was a fisherman from Capernaum supposed to have been known to the high priest? John 21:21-22. Peter asked Jesus “What about him?” — meaning “the disciple whom Jesus loved. Jesus said, “If it is my will that he remain until I come, what is that to you?” This interchange makes very little sense applied to the disciple John. But it’s a very reasonable question to ask about somebody who has already died once — will he die again? My vote goes to Esther for her courage, bravery and resourcefulness. I’m afraid that I was somewhat put off Lazarus because of the suggestion that he only smiled once in thirty years. A faith without laughter seems to be a betrayal of the generous and gifting God who holds all things in love. The woman who comes out as a Jew or a zombie… tough one. I think I’m really rewarding the guest blogger’s write up of Esther when I voted for her. Coming out and mic drop… love the contemporary twist on her actions. “Esther’s story can be seen as emblematic of how a minority can wield power within a majority culture”. What a challenge for our culture today. Esther gets my vote. Esther – for courage and diplomacy. God bless you for asking this question! If you read Esther in the Bible, she seems a bit bloody minded. She has to king for a second day to be allowed to the Jews to kill all their enemies. She also asked for the twin sons of Hamman to be executed. What did they do? So, I voted for Lazarus. Esther is one smart, courageous, resourceful cookie. An inspiration. She’s got my vote. Esther may save her people but she seems to have little sympathy for the other side, leading to the killing of Haman’s sons (which she is said to have demanded) and the further deaths of thousands. Although she was brave indeed her story so often ends with the saving but doesn’t go on to detail the aftermath. I would have voted for Vashti who truly stood up to the King. Lazarus seems to me to be about life and to be deeply woven into the deeper themes of the Bible. I am voting for him. This comment is so far along that probably no one will get to it, but….I voted for Esther because what she did affected/saved a whole race. I’ve loved her story ever since I read a book about her, written for young adults, called _Behold Your Queen_. But reading about Lazarus reminded me of a wonderful book called _Lamb: The Gospel According to Biff, Christ’s Childhood Pal_, by Christopher Moore. If you haven’t read it, you should. It explains what happened in Christ’s childhood, and in case you haven’t already guessed from the title, it takes a less serious (but still reverent) attitude towards Christ. Among other things, the author, Levi, called Biff, mentions that after Lazarus was raised from being dead for four days, he always smelled a little funny. Lamb —a little less serious? One of the funniest and very irreverent books I’ve ever read! High on my list of things that should be read by all Christians! Love that book– especially perhaps the little midrash about how his people began the tradition of having Chinese food on his birthday!!! Esther was proactive. All Lazarus did was die. Jesus did all the work in that story. And Lazarus never or seldom smiled again? I thought dying was supposed to be a beautiful experience?especially if Jesus himself resurrects you. Vote Esther. What does “of course you’re tan” mean? It casts doubt upon whether we’re rested and ready. Have to go with Esther, as she won out over the kings advisor, Haman. There may be a parallel here as it obviously was not good to be the kings chief advisor, and some may say it might not be good to be the presidents chief advisor either. Hardly a fair match up! Dude famous for being a friend of Jesus who comes back from the dead vs the champion of the Jewish people demonstrating how even minorities can exercise power? I’m sure Lazarus was a nice guy, even with that odor problem after being dead 3 days, but this hardly compares to Esther who even has a holiday in her honor. No contest. Easter got my vote because she was a person who took the risk of doing the right thing when EVERYONE was watching. I love the tender story of Jesus weeping over the death of his beloved friend. Lazarus gets my vote. I chose Lazarus for personal reasons. Like Mary and Martha, I have been asking Jesus to keep my brother alive. In my prayers I have referred to this very story and feel certain that our merciful Jesus loves my brother too. So far, although my brother has been on the fence between life and death for two months now, I continue to pray that Jesus will restore him to life, just like Lazarus. I pray that your brother and your family will be blessed with peace whatever happens. I have always been moved by Esther’s bravery. My vote for Esther was based on my usual criteria – how the saint’s story touches my heart, impact then and now, etc. But I must confess I am very eager for Esther to make it to the Final Four — imagine the joys of exploring Purim kitsch! Fun!!! Hello “Story!” Esther was the name of my (maternal) grandmother as well. My husband is abstaining today. He just couldn’t connect with either of these individuals. I’m on the fence. It probably won’t be the only time this happens to me during the Madness. Still wondering if I should give up Lent Madness for the rest of Lent. Oh, such a difficult choice: a pretty woman or a dead man! Who doesn’t like the story of a heroine? Lazarus. Including Esther in the list of “saints” seems to me an inappropriate appropriation (hmmm, is that an oxymoron?) of a legendary Hebrew heroine (whose existence is somewhat doubtful and whose story has next to nothing to do with God) into the Christian community of witnesses to Christ. Esther. Her proponent did a good job! The account of Lazarus in John 11 is a particular favorite of mine. Yet I had to go with Esther, who saved God’s chosen people from destruction. Never quite certain about the raising of Lazarus. A body begins decomposing soon after death, and after four days, I don’t see the body physically rejuvenating. Esther–so God used physical beauty to put a person of intelligence and strong character in a position to save God’s people. So why do we so often have a prejudice against beauty? I love Ester’s story but I voted for Lazarus because of the endearing and supernatural account of his ‘second chance’ in the Gospels. I like how Esther’s bio doesn’t end with her getting killed. The author was funny. To be correct, Lazarus was not resurrected, he was reanimated. Jesus is the only person to date to have been resurrected. This has nothing to do with why I voted for Esther! She risked it all so that God’s people would have a future. Hers is an amazing story of courage and loyalty, and the force of a strong and faithful woman to do make change happen. Theologically, Resurrection means something more/other than just being brought back to life. It means transformation in a sense which we have not seen except in Jesus when God raised him from the dead – the firstborn of the new creation, in a body that does not die. Lazarus died again. Jesus, on the other hand, did not. (I was ordained in the Presbyterian church, btw.) This could be a long and interesting discussion but my point is theological definition/use of the term which initially came from a Greek word – because someone would have to have invented a new word to name what God did in raising Jesus from the dead, and what we anticipate happening to us. What it is exactly, I don’t know, but I am certain it’s not resuscitation of this earthly body! It seems I am always casting my vote for the “loser” this season and again I’m voting for a man. All I could think of when I saw his name was that this was Jesus’ dear friend and upon learning that Lazarus had died, “Jesus wept”. How could I not vote for him? This man was so precious to our Saviour that He defied nature to bring him back to life. Lazarus for me! Again, it’s easy to see why Esther is killing Lazarus a second time. I’ve been reading Kazantzakis’s _Last temptation of Christ_, and Nikos makes the point in there that Lazarus was really a pretty horrible mess after being “resurrected.” “He’s been dead three days and he stinks.” He was a rotten, putrid zombie that nobody wanted to be near, and one gets the impression that he didn’t really like being resurrected. The Zealots were among those who were threatened by it, and (per Nikos) they murdered him a few weeks later. Contrary to popular opinion, it was not one of Jesus’s better miracles. I’m far more impressed by changing water into wine. I voted Esther for her courage and in honor of my Yiddish singing group. Queen Esther got a MIC DROP. Love it! as much as I love Esther…. because my first name is Martha, and my mother was a Mary, and my grandmother was a Ruth…. I just feel I have to vote for Lazarus. I know it is arbitrary…. What happens to Lazarus is so important that it is one of the Scrutinies studied while becoming Catholic. I think it was often studied for Episcopalians s also, but not sure if it is still used. What can be more important than rising from the dead? It seems that every year the SEC gets criticized for including Old Testament figures in the tournament. Historical divisions were irrelevant when the writer of Hebrews constructed the “hall of fame” in chapter 11. Paul considered Abraham to be a “paradigm” of faithful living. Of course we view their faith as incomplete, but their lives are remembered as champions for God, and their perseverance is particularly remarkable in the light of their living without the full benefits of the indwelling spirit of God! Esther got my vote. The best sermon I have heard in my 80 years was preached by Bishop Barbara Harris at the ECW gathering at the Eucharist at General Convention in 1991. She talked about Esther’s bravery and her willingness “to go to the king.” That use of the story of Esther has encouraged me personally. My vote is for Esther whose actions inspired this collect I wrote early last year. Give us strength O God of Esther who has called us for such a time as this. Enable us to contend against the spiritual forces of evil and the cosmic powers over this present darkness. Give us the grace to make no peace with oppression, and the spirit to think and to do that which sets at liberty those who are oppressed, that our society may be cleansed and strengthened. This we ask through Him who humbled Himself to share our humanity, Thy son Jesus Christ, who lives and reigns with Thee in the unity of the Holy Spirit, one God, for ever and ever. I voted for Lazarus because he was resuscitated, not because he was resurrected, which he wasn’t. I voted for Esther because of her bravery and because I’ve always loved her story. I also wanted to vote for Lazarus, and I’m glad that all these saints already have their halos. Just curious though–was Vashti killed? I always thought she was banished. What am I missing?